I used to make weekly and monthly menus so that I could cook ahead as much as possible. I made a lot of casseroles that would freeze easily. Now, with more of an emphasis on fresh foods, I haven’t been planning ahead very much and I’m noting more mealtime stress. It is hard to cook ahead and still make everything from scratch and use fresh ingredients. I decided to do a modified version of plan ahead cooking. Today, I pulled two cookbooks and planned a week’s worth of meals noting where I could cook ahead and simply laying out plans for the rest of it. I won’t be able to cook ahead very much but I will be prepared for the meal when it comes. 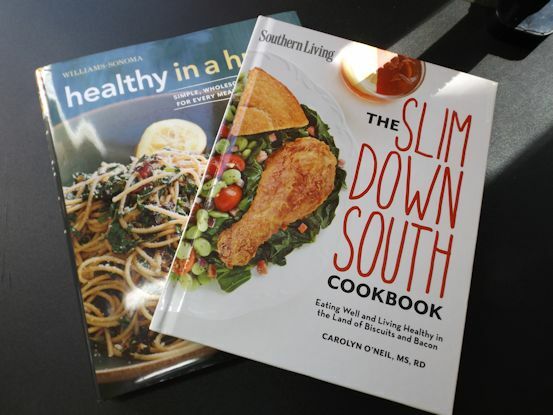 I used the new Southern Living The Slim Down South Cookbook by Carolyn O’Neil and the Williams-Sonoma Healthy in a Hurry cookbook by Karen Ansel and Charity Ferreira. Both are currently available. I purchased the Southern Living cookbook in my local grocery store book/magazine section and the Williams-Sonoma book in a Williams-Sonoma store (imagine that). Here is what my menu planning looks like. I make a chart of the meals I want to prepare and give the page numbers of the cookbooks. I make a column of any preparations I can do ahead and then a make a column for any needed groceries. This is not an inclusive shopping list for the recipe. I am simply putting what groceries I don’t already have on the list. There are a lot of great websites that do once a month meal planning that will provide inclusive shopping lists. I like looking at the sites but I always end up planning my own menus. I am not a fan of green peppers or Parmesan cheese and both seem to end up in many recipes for some reason. As we make these recipes during the week, I will include the recipes in the blog or the modified recipes as we make them. For now, I’m just including my good intentions!